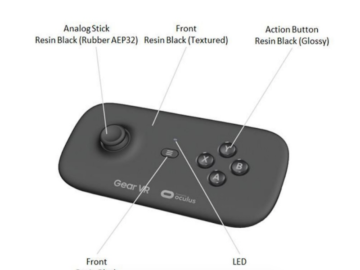 A leaked render has surfaced online revealing that Samsung is developing a Bluetooth-enabled controller to work alongside its Gear VR headset. 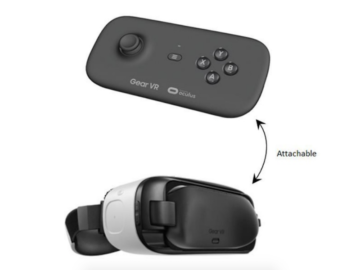 Unlike Oculus, who bundled a standard Xbox controller with all Rift units, Samsung’s offering has been designed from the ground up to work exclusively with its virtual reality device, which is why it can be popped into the front of the headset when it’s not in use, making it extremely portable. As the Gear VR is powered by Oculus, the controller itself sports the Oculus logo, together with a single analog stick on the left, four action buttons on the right and two shoulder triggers up top. There’s also a dedicated Menu key that can be used to pull up the Settings panel on the headset. Positioned neatly in the center of the controller is an LED that glows blue when it’s on and flashes red when it’s low on battery. 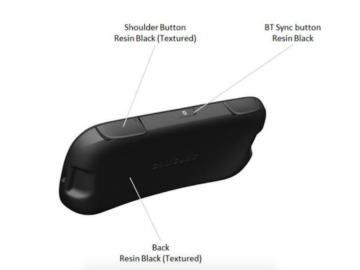 Unfortunately, we have no information with regards to pricing and availability, but we think that it will hit the market sooner rather than later as this will be a great addition to any Gear VR owner’s lineup of compatible accessories. We just hope that it picks up more traction than the firm’s Smartphone Gamepad that launched in South Korea over two years ago and was pulled from the shelves shortly after due to a lack of interest. Too small to play Minecraft (unless you enable Immersive Mode, you need 2 thumbsticks for movement), still, rather get a full sized gamepad for any game, unless it actually only requires one thumbstick.